The wait for Voice of Isengard continues, but the stream of content here at TftC continues with yet another Card Spotlight. The search for the good, the bad, and the ugly in the card pool is nothing new. 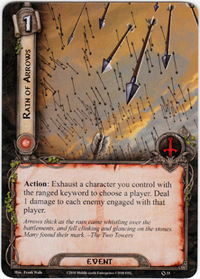 It began as soon as the Core Set was released, and one of the cards that often ended up on the wrong end of that equation was Rain of Arrows. While the idea of literally unleashing a storm of arrows upon a crowd of enemies is compelling, many players (including myself) have dismissed this card in practice. Has that judgement been correct, or have many of us been paddling down the wrong river all along? Read on as this edition of Card Spotlight gets to the bottom of this quandary! The biggest knock against Rain of Arrows has been the fact that it requires exhausting a ranged character (thus losing that character’s action) to deal a single point of damage to all enemies engaged with a player. In many cases, it has seemed preferable to use that ranged character to deal multiple points of damage to one enemy through a conventional attack, rather than to spread out drops of damage among many. Still, it can’t be denied that dealing out damage to multiple enemies at once is useful. It’s just a classic case of there always being other cards that are more essential or better to include. Action: Exhaust a character you control with the ranged keyword to choose a player. Deal 1 damage to each enemy engaged with that player. This Tactics event costs only 1 resource, and this is quite affordable and reasonable. However, as mentioned earlier, the real cost is the exhaustion of a character with the ranged keyword. Generally, ranged characters tend to have high attack values, which makes losing their contribution to conventional combat all the more damaging. In addition, when Rain of Arrows was released, there were very few ranged characters available, which limited the options for mitigating this cost. There was the possibility of using Legolas together with Unexpected Courage to have your cake and eat it too, but many times you would still rather have two attacks with Legolas than a single attack combined with Rain of Arrows. Now, however, the possibilities for Rain of Arrows have dramatically expanded due to three developments: 1) the addition of more ranged characters, 2) the proliferation of direct damage effects, and 3) the introduction of Tactics card recyling. In the Core Set, there were 3 ranged characters (Legolas, Silverlode Archer, and Horseback Archer); now, there are an impressive twelve. Vassal of the Windlord is a particularly good candidate for Rain of Arrows, as this ally is cheap (1 resource), and can only attack once before it is discarded anyway. Thus, you can get an extra “use” out of a Vassal by having it trigger Rain of Arrows (I’m assuming the Vassal is flying over the enemy and dropping arrows down on their heads). Trollshaw Scout is also an intriguing option, as you can attack with that ally without exhausting, and then use it to activate Rain of Arrows, perhaps finishing off several foes at once. This approach of using allies in conjunction with Rain of Arrows is nice, as it avoids having to sacrifice the action of a hero. Even better, both are cheap and powerful, compared to the 3-cost Silverlode Archer and Horseback Archer of the Core Set. Don’t forget that with multiple ranged characters in play and multiple copies of Rain of Arrows in hand, you could deal 2 points of damage to a group of enemies at once. The addition of more and more direct damage to the card pool has also increased the value of Rain of Arrows. Combining Thalin with Rain of Arrows was the best bet in the Core Set, and that still remains the most consistent and effective option. With those two effects working in tandem, you can deal 2 damage to every enemy engaged with one player during the course of a turn. This can be absurdly effective in some of the Khazad-Dum quests, which feature a bunch of enemies with just 2 hit points, but can be useful in almost any scenario to soften up one’s foes. Beyond Thalin, though, there are now options like Ranger Bow, Spear of the Citadel, Dwarrowdelf Axe, and Descendant of Thorondor that can heighten the relative impact of Rain of Arrows. 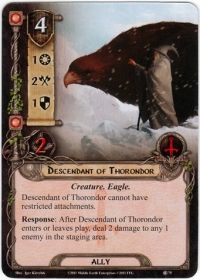 Perhaps the best combination would be an Eagle deck with Thalin, combining Rain of Arrows/Vassal of the Windlord with Sneak Attack/Descendant of Thorondor. 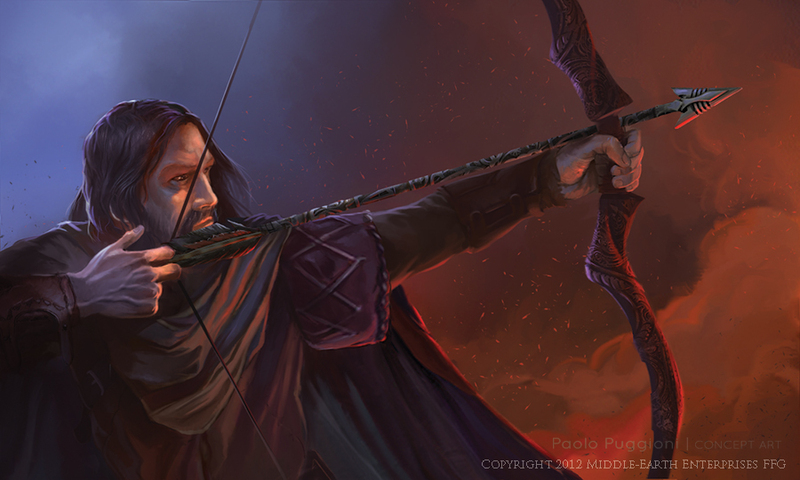 Rain of Arrows could also form a neat accompaniment to a Ranger trap deck that seeks to maximize usage of Poisoned Stakes through Anborn and Erebor Hammersmith. If that wasn’t enough, the upcoming development of the Silvan trait should also open up some intriguing (and thematic possibilities), with Rumil (spoiled in the Dunland Trap preview) seeming to form the basis for a ranged, direct damage Elf deck that would provide a perfect home for our spotlighted card. With all of these deck types, damage-dealing defenders like Beregond/Spear of the Citadel and Gondorian Spearman are fantastic complements, because if Rain of Arrows can get you within 1 point of enemy destruction, these characters can do the rest. One thing that must be said, however, is that with so much direct damage available now, decks that just want a splash of such damage will likely always pick something over Rain of Arrows, which means that this event seems to only have a place in decks that have direct damage, and the combination of such effects, as their primary focus. The final current in favor of Rain of Arrows is the arrival of Tactics recyling through Hama and/or Book of Eldacar. Before these cards were released, using Rain of Arrows just a couple of times per game often seemed too marginal an effect to justify inclusion over other cards. By contrast, with recycling, you can be pretty certain of getting multiple uses out of it per game, which might boost its value through pure consistency. With Hama and Thalin, you could conceivably drop 2 points of damage on a group of enemies every single turn, although this may be a bit unrealistic, as Hama would probably recycle other cards as well, but it is possible. Pushing against the forces that are raising Rain of Arrows to relevance are several obstacles that prevent it from truly becoming an indisputably useful card. The first is the issue of enemy density, which can be stated more simply as the number of enemies on the board and engaged with each player at any given moment. The issue is that if there are only one or two enemies engaged with any given player, then Rain of Arrows might not be a worthwhile play (although there are exceptions). In fact, I would argue that there needs to be at least three enemies engaged with a player before I would consider using this event, and generally this isn’t something that happens frequently (when it does, you’re either doing poorly or running a combat deck designed to make this happen). Thus, Rain of Arrows might be something that only helps you “lose less” rather than manage the board proactively. On the other hand, a focused direct damage deck might be able to thrive on a strategy of engaging lots of enemies (perhaps with the help of something like The Hammer-stroke), choosing to tank foes in order to set up a final volley. Again, though, this is a risky strategy that might appeal to the combo-minded player, but not one that prioritizes conservative enemy management and consistency. Another limitation is the tendency for the hit points of enemies to gradually increase over time. Whereas 3 or 4 hit points may have been average in the past (sometimes less), enemies with 5 or 6 points are not at all uncommon these days. This means that dealing 1 point of damage has a smaller impact than it did previously, and this may necessitate replacing Rain of Arrows with cards that can deal damage in a much more concentrated fashion. Still, many times I’ve found myself a single point of damage shy of finishing off an enemy, wishing for something that can make up the difference. Rain of Arrows may come in handy in such cases. I suppose it all depends on whether you conceive of it as an event that is menat to destroy enemies outright, or one that strives to weaken them sufficiently to cut down on the time it takes to clear the board. With the positives and negatives balanced and weighed, the fate of Rain of Arrows rests on a knife’s edge. The possibilities for this much-maligned event are intriguing, with a Thalin/Hama/Beregond (with Spear of the Citadel) direct damage and ranged deck beckoning in the present, and a hit-and-run Silvan build teasing us in the future. On the other hand, Rain of Arrows appears to be a niche card that probably will only find a place in specialized decks that can build upon its effect. As such, it is a card that will likely continue to be cut when decks need to be pruned. Still, the potential for this card and its current viability so far exceed its meager reputation that I feel compelled to give it the official TftC stamp of approval. What’s that art from? I’m crazy about it. Trollshaw Scout is the primary exception to this. However, Trollshaw Scout himself is a ripe candidate for a Coaster or Gem article. Still, ways of dealing direct damage are almost always going to be useful in someway. However, it’s the Hail of Stones event that I think really relegates Rain of Arrows to the back of the binder. I was thinking more of a situation where you have a couple of enemies that are close to death, not just one. That’s really the one thing that Rain of Arrows has over most other direct damage effects, including Hail of Stones; the ability to deal damage to multiple enemies at once. However, I would agree with you that in most cases I would choose Hail of Stones specifically and concentrated damage generally over the spread out damage of Rain of Arrows. Still, I think Rain of Arrows has more uses than it is generally given credit for, which was my basis for giving it the gem tag. I almost feel like bulkier enemies make this more useful – for one thing, you’re less likely to just be able to maim them with Thalin then finish them off with a Gondorian Spearman, so you need extra effects, and secondly bigger pools of hit points tend to coincide with higher defence values, making it less likely that your ranged character could just punch through with a conventional attack. I haven’t used this card in a long time, but I can definitely see a place for it. In my eagle deck, I generally try to get support of the Eagles out on Legolas or Beregond, and then use it to target a Vassal of a Winged Guardian respectively – ideally i never use them for their own effects until I’ve got Eagles of the Misty Mountains in play. In this context, the “exhaust a ranged chracter” bit is essentially free, as they aren’t doing anything anyway. Great point. Those tough enemies nowadays with their high defense values might tip the scales in favor of Rain of Arrows. I’ve tried several times to build a deck based around Tactics Boromir’s self-discarding action. In such a deck, Rain of Arrows is a no-brainer as you can potentially do 3 points of damage to every enemy engaged with you. Add the Hammer-stroke to make it every enemy on the board, but then it starts to get expensive. I know what you mean. 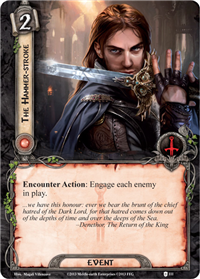 I’ve had dreams of building the Boromir Ultimate Sacrifice deck with Hammer-stroke and Rain of Arrows, but it always seems a bit optimistic, especially now that I’ve been spending most of my time playing Nightmare. While it may not have reached stellar standards then direct damage decks are certainly viable on certain quests, and while rain of arrows isn’t exactly a power card, it certainly isn’t a card that you’d scorn someone for playing these days. I’m very interested to play 3 or 4 players where you go in quite strongly for direct damage. I imagine that if you had Thalin and 3 or more bows in play, you could probably dispatch most enemies before they engage. Oh the feeling of slaying a foe before they can slash their orcish scimitars! It’s a good feeling. And part of why “Hand’s upon the Bow” is my single favorite card in the game. I thought that Rain of Arrows was totally useless. But one time, i created a fanmade: War of the Last Alliance. And this card is very powerfull here (like Thicket of Spears). You must think that there are cards for combat, hard combat. You dont rain lots of arrows against one or two enemies, neither defend with tons of spears agains one or two enemies. In War of the Last Alliance they become the best cards in the game, because you engage tons of enemies, sure! Other cards useless but powerful here are the longbeard dwarf of the core, he damages each orc in play, and in War of the Last Alliance he is very very powerfull. Maybe Rain of Arrows will be similarly useful against a future Helm’s Deep scenario. Nice job on your custom quest, by the way! As a newbie playing with just the core set, I really wanted to find ways to make this card work. What springs to mind is a direct-damage deck revolving around Thalin, Gondorian Spearmen, Stand Together, Swift Strike, and Rain of Arrows. Stand Together is a card I love as it allows you to combine defenders, allowing you to upgrade the Gondor Spearmen from ‘chump blockers who happen to deal a point of damage, and might occasionally survive if the attacker is down to 1 HP’ to ‘team damage-dealers who can combo with tank-ish heroes’. The problem is, the core set only includes 1 copy of Stand Together and Swift Strike, Legolas is too good on his own to exhaust to deal 1 damage to most enemies, and the Ranged allies are generally too expensive. Welcome! Yeah, the biggest problem with Rain of Arrows when it was released was the limited card pool it had to work with, as you point out. It’s still not a world beater, but it’s a lot more viable thanks to more and cheaper ranged, more readying, and more direct damage in the card pool. Yeah I really love this card! Even though a lot of possibilities are opening up for a direct damage type archery deck, I feel like, as you say, with the rising hit points of enemies, that this card will be less and less effective. When I think of this card I always think of “into the pit” and “seventh level”. Hopefully there will be more cool scenarios with swarms of weak enemies!